Giulio Cesare Russo was born in Brindisi in 1559. He entered the Capuchins in Verona and took the name of Lawrence. He was ordained a priest and used his vast and profound knowledge of Sacred Scripture in the service of Church reform after the Council of Trent. As a linguist he preached with great success among the Jewish people, and fulfilled numerous diplomatic missions for the friars and Minister General of the Order. 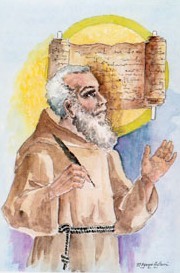 Through all this, he remained a humble son of St. Francis. He died in Lisbon on his 60th birthday, on July 22, 1619. He was beatified on May 23, 1783 by Pope Pius VI and canonized by Pope Leo XIII on December 8, 1881. Because of his many works, Pope John XXIII declared him Doctor of the Church on March 19, 1959 with the title “Apostolic Doctor”. Almighty God, for the glory of your name and the salvation of souls you conferred on Saint Lawrence the priest the spirit of counsel and of fortitude. Grant us in the same spirit to know what we are to do, and through his prayers, to do what we have come to know. We ask this through our Lord Jesus Christ, your son, who lives and reigns with you and the Holy Spirit, one God, for ever and ever.